Enrollment is EASY at KIDS CO-OP! Register NOW with Open Enrollments Register NOW for “NO BUMMER SUMMER CAMP” Call TODAY for Special Pricing Information! 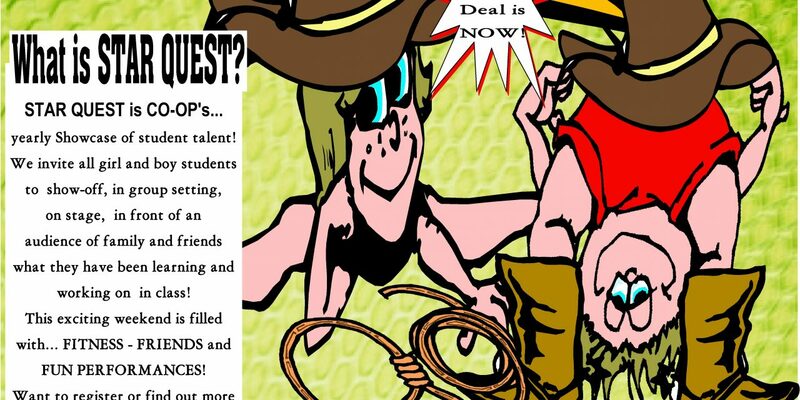 Register NOW for “WILD WEST STARQUEST” Our BIGGEST Event of the Year! We have a wide variety of programs for children of all ages- walking toddlers, preschoolers, and school-age children. We offer programs in recreational gymnastics, tumbling, trampoline, jazz, ballet, tap, twirling and competitive gymnastics. CO-OP gymnastics has a highly competitive team program that trains from Developmental – International Elite. We maintain a high level of excellence with an emphasis on strength; along with, building a strong basic foundation. We are proud of our numerous state, regional and national champions. When it comes to fun, we have something for everyone – trampolines, cargo net, a fitness fort with a wave slide, monkey bars, and a fun foam pool pit. Experience the difference at CO-OP Gymnastics. Plan your party with us and enjoy 90 minutes of fitness, friends & fun. Stay up to date with all of our recent and upcoming events and news. It is time to register your child for our popular NO BUMMER SUMMER CAMP! This year our camp will be at held in Palmer Township which means new equipment, new activities, and more fun! Call us now at 610-861-9151 to receive pricing as low as $185 per week*. For any immediate questions please email gaby@kidsco-op.com. Our Biggest Recreational Event of the Year! Sign up now for STARQUEST 2019!